Score top side of ham. If desired, add whole cloves to the intersecting lines of your scoring. 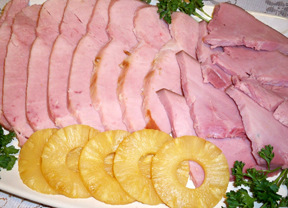 If you do not like clove-flavored ham, you do not need to insert them. The scoring will just allow the flavoring of the glaze to seep in more. Bake in 275 degree oven - uncovered-do not add water. Total baking time: 5 hours. Mix the Glaze in the blender. 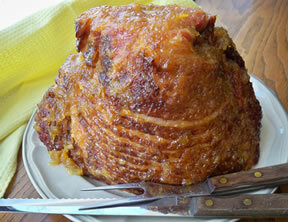 After the first 2 hours of baking, pour the first of two parts of the glaze over the ham. Two hours later pour the second part of glaze over the ham. 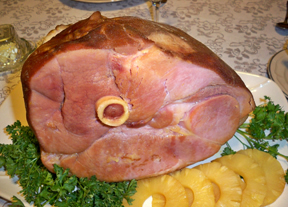 Ham can be served hot or cold. "I got brave and decided to try fixing a ham. I tried this recipe because it look fairly simple even though it had a glaze and I had never glazed anything. I didn't use the cloves because my husband didn't think he would like them. Anyway, the recipe turned out great! We both loved it!"